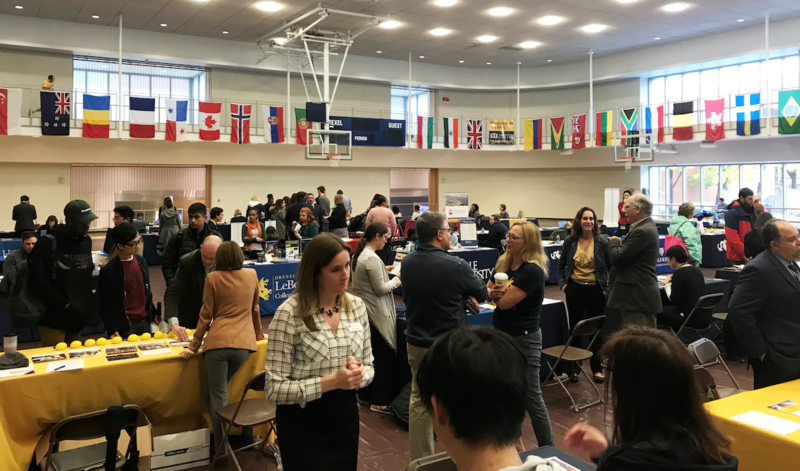 Drexel University drew in a modest crowd of people who are interested in graduate school to the recreation center gym Nov. 6 for its first annual graduate fair. The public event, which took place from 11 a.m. to 2 p.m., offered visitors the opportunity to meet with graduate representatives from several Drexel programs — such as the Thomas R. Kline School of Law, the College of Computing & Informatics, the College of Arts and Sciences and others — as a well as universities from across the region. Some of the other universities included Columbia University, Brandeis University, John Hopkins University, University of Pittsburgh, Pennsylvania State University, University of Delaware and Villanova University. According to associate director of graduate admissions Justin Dahlin, the event had a good turnout despite it falling on Election day and rainy weather conditions. It was important to include a variety of institutions in the event’s lineup. That way, prospective graduate students could look into other programs they’re interested in that Drexel may not offer, he said. Dahlin’s colleague, graduate admissions’ assistant director Caterina Moreira, believes it’s also a good opportunity for students in the Philadelphia area to be able to meet with representatives that they may not have had the chance to otherwise. “In our recruitment travels to other schools, we generated a list of universities that we saw a lot of our students go to, so we invited the [university representatives] here so students could speak with them,” she said. The graduate fair attracted students who are exploring their options. Taylor Johnson, a design and merchandising senior, found interest in pursuing education in digital marketing after a conversation with representatives from John Hopkins University and University of Delaware. Meanwhile, other attendees looked to branch out of Philadelphia, and even learned about universities they’ve never heard about. Aurelia Sugita, an Indonesia native, is in her final year at Drexel as a psychology major. After spending several years in University City, she hopes to continue her education in New York City —particularly Columbia University. To some recruiters, it was fun speaking to visitors about the college they represent. Duquesne University student affairs specialist Shantale Davis, whose tasks involve traveling to cities nationwide for undergraduate and graduate recruitment, considers herself an expert of the Pittsburgh-based school. Since she received her bachelor’s degree from Duquesne, she feels she can address many of the questions students may have about the university. Villanova University recruitment director Anthony Penna enjoyed explaining to students the versatility of a master’s degree in business administration. One of the students Penna interacted with was Matt Sigda, an electrical engineering pre-junior. Although Sigda did not initially intend to visit the graduate fair, he’s glad his friends dragged him to the event. Dahlin and Moreira have been planning the event since April. Promotion plans for this event included email blasts, social media and music streaming platforms like Spotify and Pandora. The department also took a grassroots approach and posted flyers across Drexel’s campuses, small businesses and cafes. Those who missed out on this year’s first-ever graduate fair shouldn’t fret; the university plans to host one every fall term.